You have to wonder how this meeting went, given the acrimony between these two men. In the latter part of 2016, when the Saudi Prince likely thought Donald Trump had no chance to be president, the two got into a Twitter battle. The prince’s tweet included news stories showing that he bought Trump’s yacht in 1991, which had been turned over to creditors when he was $900 million in debt, according to Buzzfeed. The crown prince supported Hillary Clinton. He had dropped a lot of money Obama’s way in his two elections. Donald Trump seems to be meeting with all the naysayers, for example, he met recently with Democratic Congressman John Lewis. Recall that Lewis boycotted President Trump’s inauguration, and hails from the “not my president” ilk. Guess what: Trump is Lewis’ president. President Donald Trump met with Saudi Arabia’s Deputy Crown Prince Mohammed bin Salman at the White House on Tuesday for a discussion likely to touch on economic relations and efforts to stop the war in Syria. 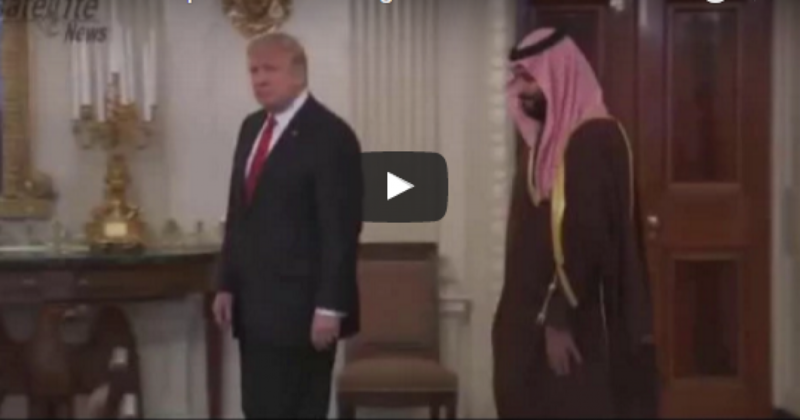 Trump, who took office in January, and Prince Mohammed, who is also the kingdom’s defense minister, kicked off their talks in the Oval Office, where they posed for a picture in front of journalists and did not take questions. The Saudi’s don’t have much choice, and you can bet in his own way President Trump made that clear. The meeting was the first since Trump’s Jan. 20 inauguration with the prince, who is leading the kingdom’s efforts to revive state finances by diversifying the economy away from a reliance on falling crude oil revenues. Also expected to be on the agenda were the war in Yemen, where a Saudi-led military campaign has failed to end a rebellion by Houthi militias, and cooperation against Islamic State. Gulf Arab officials have appeared optimistic about the Trump presidency. They see in him a strong president who will shore up Washington’s role as their main strategic partner and help contain Riyadh’s adversary Iran in a region central to U.S. security and energy interests, regional analysts said. Let’s face it, President Trump’s take on oil has to be music to the Saudi’s ears, at least for the time being. And despite Obama having bowed to the Saudis in the beginning, they ended up underwhelmed. The Saudis were dismayed that Obama seemed to put more emphasis on Iran’s negotiations, than the interest of the Saudis. In fact, late last year Obama suspended the sale of U.S.-made precision guidance munitions to the Kingdom. This action was supposedly the Obama administration’s punishment for the Saudis, based on the civilian casualties from Saudi-led air strikes in Yemen. The State Department has approved the move, which awaits a final White House decision, according to sources. I have said for some time that the U.S. economy which represents almost one-quarter of the world’s GDP represents President Trump’s biggest bargaining chip. An anonymous source close to the issue commented that a main topic of the meeting would be Saudi investment in the U.S. You can bet that Donald Trump will tell the Saudis two things: (1) Get a handle on terrorism, or (2) America won’t open its economy to them. Don’t be surprised if soon President Trump announces a “Big Deal” between the Saudi’s and the United States.